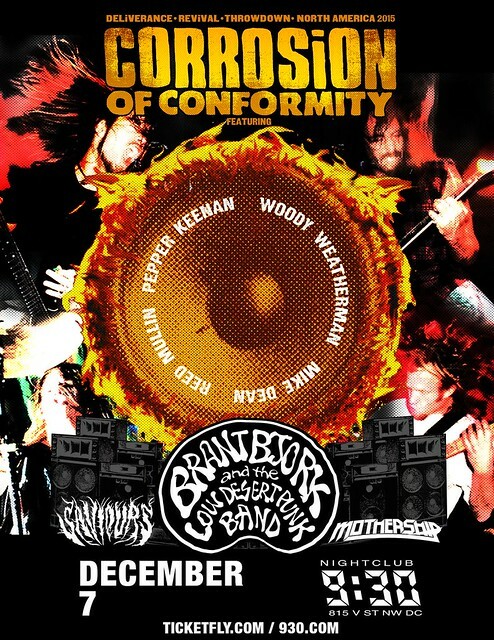 December 7th is known as a day that will live in infamy so it is fitting that on Monday, December 7th, 2015, Corrosion Of Conformity will be playing the 9:30 Club! We couldn’t be more excited about the long awaited return of Pepper Keenan to the band so we’re going to give away a pair of tickets to the show to one of you lucky DCHM readers! To enter just leave a comment on this post telling me what your favorite metal concert or fest of 2015 has been. If you haven’t been to any metal concerts this year then tell me which one you’re most looking forward to. At 5pm EST this Friday, December 4th, a winner will be chosen at random (using Random.org) from all valid entries to win the tickets. Be sure to use a valid email you check regularly so I can contact you if you win. Don’t worry, I won’t add you to any spam lists or sell your info or anything sleazy like that. If I haven’t heard back from the winner in 24 hours another winner will be chosen at random. If you can’t wait to see if you win or the contest is already over when you read this, then you can get tickets from Ticket Fly for just $20 here. Pepper Keenan has been busy with his other band, Down, for years but now he’s back in Corrosion Of Conformity to play guitar once again for the North Carolina based sludge metal band. Also on this show’s bill will be Brant Bjork and the Low Desert Punk Band. Brant Bjork has been in a ton of bands but he is probably best remembered for being the drummer and a founding member of Kyuss and for his time in in Fu Manchu. There will also be a set by Oakland based thrashy stoner band Saviours. The opening act is Mothership, who aren’t a funk band but are actually a stoner band from Dallas. That’s a hell of a line up for just $20! Now check out these videos of the bands playing and let me know what your favorite metal concert of 2015 has been! That Exodus show the other week. That was a banger! ULI JON ROTH … legend. ghost! kicking off in maryland was KILLER. Korpiklaani at Baltimore Sound Stage!